Of the numerous nautical instruments that are carried aboard ship, early navigational pieces are particularly sought after. The crosstaff and backstaff were one of the first items to have been made for marine navigation. Often made from boxwood and inset with the makers' name, good early examples of a backstaff from around 1760 can fetch between £2,000 and £3,000 at auction. by James Cox of London. The development of navigational aids from the backstaff through to reflecting instruments, such as the octant and perhaps more widely known the sextant, has been through many variations. With the development of trade routes in the 18th century, more and more instrument makers arose from a clock-making background to become instrument makers. Octants and sextants made by notable London makers such as Dollond, Troughton and Walter for example, regularly achieve from £300 to 500 at auction. 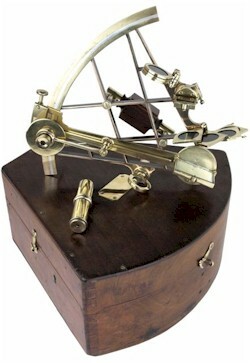 A 19th century ebony, brass and ivory inlaid octant. Marine chronometers are still among one of the most popular items of ships' instruments that are sought after by collectors. The marine chronometer that we most commonly know today, by makers such as Le Roy, Dent, Frodsham and Denison, were developed during the 19th century period of industrialisation. As well as marine chronometers, makers such as Dent also produced marine compasses during the 19th century. 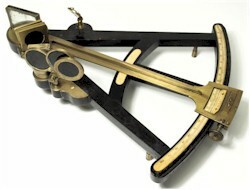 These compasses range from the small portable type to the larger compensation binnacle compass of the Kelvin and Thompson type, typically seen by the helm of ships of the period. sold for £2,700 in one of our maritime auctions. Marine compasses and chronometers are only a few of the many instruments used aboard ship. Ships' logs and sand glasses are still the basis of measuring speed on a sailing vessel. Sun dials, ring dials, sectors and quadrants are all still viable ways of navigation today. Early 17th and 18th century pieces command high prices at auction. 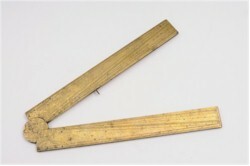 For instance, a good 17th century brass folding rule by Walter Hayes (fl 1642-1692) sold in 2012 for £2,700.